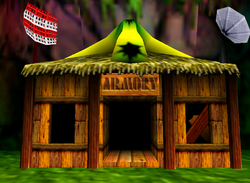 Funky's Store is a location run by Funky Kong in Donkey Kong 64, where he sells weapons and upgrades to the Kongs. The location is a wooden shack with a set of three large bananas on top. The music and atmosphere of Funky's Store is based on an army surplus store; the location even has a front sign reading "ARMORY". The Kongs can also visit Funky's Store to have their ammo supply replenished if it is below the maximum amount. In the game's kiosk demo, the building exterior's sign reads "ARMOURY". Both the satellite and the satellite dish are absent from the roof. Funky provides a unique weapon for the Kongs, each priced at three Banana Bunch Coins. Each Kong can individually purchase their weapon from their first visit at Funky's Store. By default, every Kong's weapon only carries up to 50 ammo. They can purchase a few extra upgrades for their weapons later in their adventure. ↑ 『任天堂公式ガイドブック ドンキーコング64』. Page 5. This page was last edited on January 28, 2019, at 22:06.